Most of us are well aware of the risks involved in putting potentially hazardous cleaning materials and equipment in the hands of untrained personnel. Even with the increasing amount of environmentally aware products, there remain far too many accidents with chemicals, electrical equipment and lack of awareness of health and safety procedures. 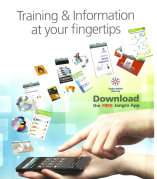 Jangro has always offered a range of customer training packages including a DVD, training manuals, video and PowerPoint presentations, wall charts and certificates. However we now have 10 online training courses which you can access free of charge by entering our special voucher code, see below.